Written July 8th, 2015 — Community Engagement | Community Life | Events | Resident News. Eight tons of snow, 525 pancakes and 120 American flags are just a few of the elements that made for a spectacular Star-Spangled Celebration. Last weekend’s event, the ninth of this annual Marley Park tradition, brought more than 500 residents together to celebrate our nation’s independence. To kick off the morning, Boy Scout Troop 194 served breakfast to 175 hungry Marley Park residents. Yes, 525 pancakes were flipped, topped and devoured, helping residents start the day happy and satisfied, all while helping support our local Boy Scout troop. 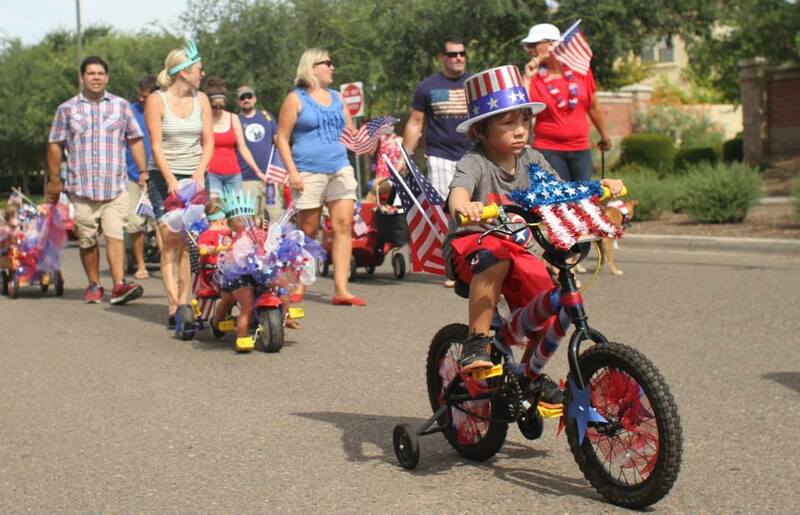 Following breakfast, more than 150 residents lined up with their decorated wheels to walk or ride in the Patriotic Parade. Dressed in red, white and blue, they waved American flags and showed their American pride from Marley Park to Veteran’s Commemorative Plaza. A few even donned Lady Liberty hats—now how’s that for patriotic spirit! At 5:30 p.m. residents were lined up in front of the Heritage Pool House to get into the Star-Spangled Celebration Pool Party, which some consider their favorite Marley Park event of the year. Inside, the evening was abuzz with excitement. 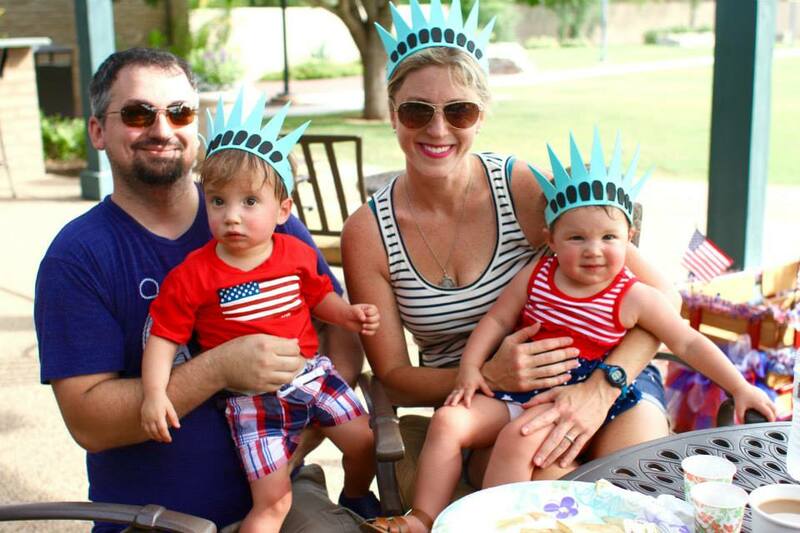 Families feasted on an all-American barbecue dinner while kids tested their limbo and hula hoop skills. Hanging out in the pool gave residents the opportunity to meet new neighbors and cool off a bit. Kids and grown-ups alike enjoyed sliding down the 20-foot inflatable water slide. And we can’t forget to mention the 8 tons of snow that was trucked in just hours before the pool party. With a high of 106 degrees that day, it was quite a sight to see kids in their swimming suits sliding down a pile of snow and having the time of their life. 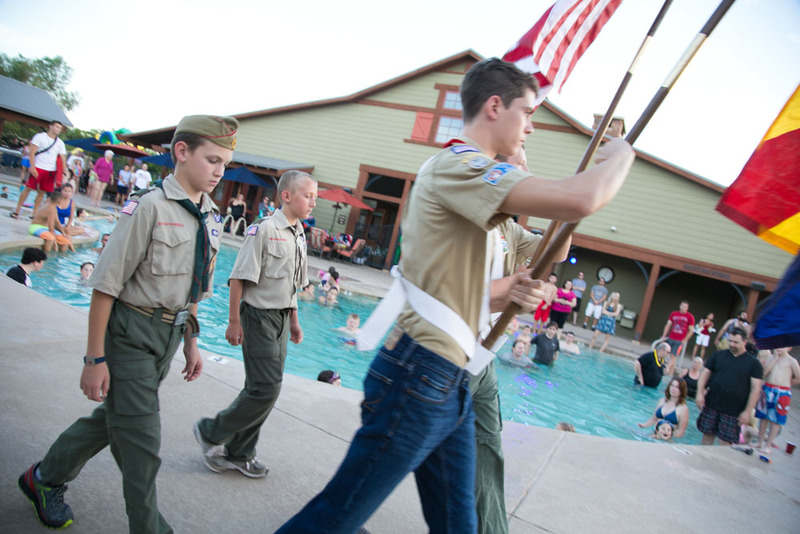 The most memorable part of the evening was when 12-year-old resident Juliette Hathaway sang an almost angelic rendition of our national anthem, while the Boy Scouts stood alongside proudly holding the Arizona and United States flags. For those couple of minutes the entire crowd stood still, focused on paying respect to those who made our nation’s independence possible nearly 240 years ago. The day could not have been successful without the generous support of our Marley Park resident volunteers. Twenty seven volunteers worked tirelessly from 5 a.m. to 11 p.m., decorating, lugging equipment and supplies, checking people in, serving snow cones, and just making sure the day ran smoothly. What makes Marley Park such a great place to live? Many would say our sense of community. This year’s Star-Spangled Celebration was another prime example of Marley Park residents coming together to make Marley Park a place residents are proud to call home.